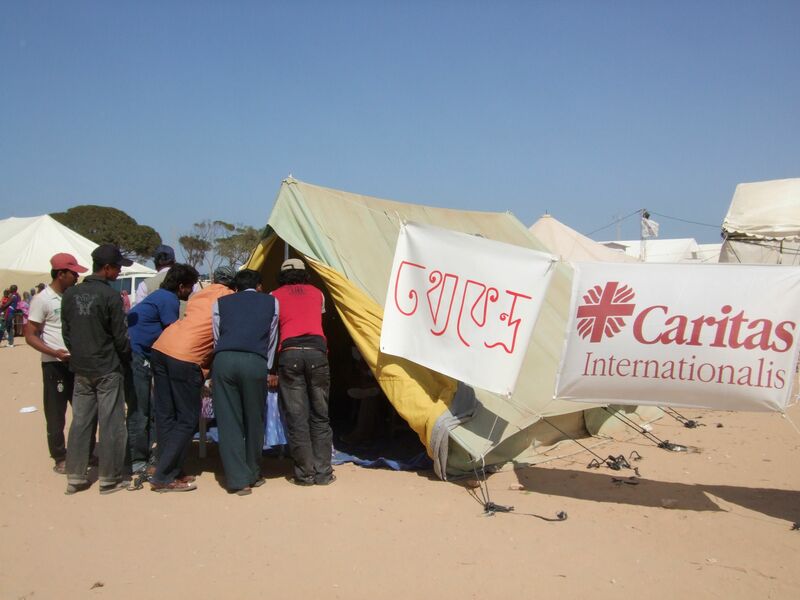 Danielle Leblanc from Secours Catholique –Caritas France reports from the programme Caritas has set up at the Tunisian-Libyan border to help stranded migrants fleeing the conflict in Libya in their repatriation process. They are there every morning and until late in the afternoon, surrounding our information tent. The three cultural mediators from Caritas Bangladesh and its partner OKUP always have a lot of work. When is the next flight? When can we go back home? That is the only thing the migrants really want to know. Many migrant workers from Bangladesh had been living in Libya for a long time, often for several years. Most of them were employed in the construction sector, in the capital Tripoli but also in Brak, Misurata or Nalut. When the fighting began, the companies they worked for had to shut their doors. Sometimes, the employers gave the migrants money so that they could leave the country. Most of them shared the cost for renting a bus that would take them to the Tunisian border. On the way, their money, electronic devices, mobile phones and even their SIM cards got robbed. The Bangladeshi migrants are young and most of them are without formal education. On average, they are 27 years old. Like many of their fellow citizens, they had left their homes to work abroad and send money to their families back home. Unlike many other migrant workers transiting through the camp, a lot of Bangladeshis are in possession of a visa and a working permit. But some of them had been abused by corrupted civil servants and had entered Libya through a network of human trafficking from the Bangladeshi capital Dacca to Libya across intermediaries. Then the conflict started and they lost their jobs. So that’s why they left to go to the closest border which was the Tunisian one. The Bangladeshis made up the biggest group of migrants who entered Tunisia after the clashes in Libya started. Around 22,000 of them transited through camps in Ras Ajdir since 19 March, 14 percent of the total number of people. Supporting the Bangladeshi migrants was particularly challenging because they formed a very big group and most of them speak only Bengali and sometimes a bit of English. Caritas Bangladesh and its partner OKUP, by agreeing to send three of its social workers to the camp as mediators, contributed to alleviate the tension within this community. Through the Caritas information and orientation centre in the Shousha camp, the migrants can get better access to other available services, ask for regular evacuation flights towards Dacca, document their experiences and get information about reintegration possibilities back in their home country.